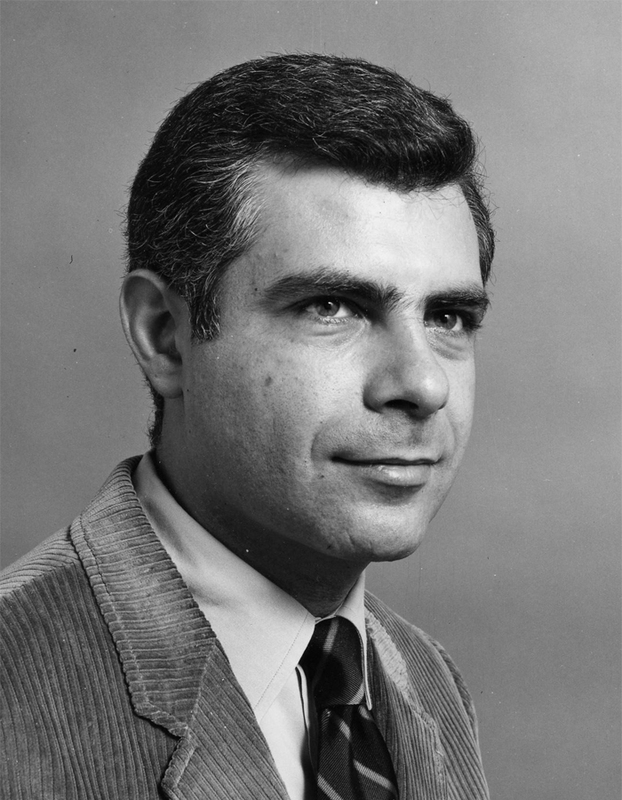 Len Sirowitz was chosen as ”The Number One Art Director in America” in 1968 and 1970 polls taken by Ad Weekly. 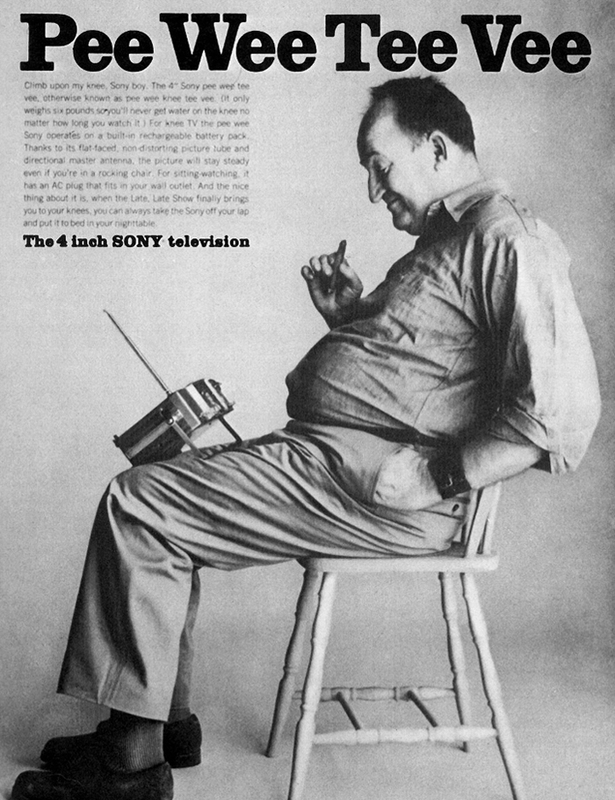 He was then Senior Vice President and Creative Management Supervisor at Doyle Dane Bernbach and his accounts included corporate giants like Mobil, Volkswagen and Sony, regional accounts such as Laura Scudder Potato Chips and Rainier Beer and national advertisers like Sara Lee and Parker Pens. He credits DDB with providing the creative environment that encouraged talent like his to produce award-winning advertising. To work at DDB was to be part of the creative revolution of the 60s and for Sirowitz it was like being a team member for the 1927 Yankees. The other players on the art side included Helmut Krone, Bob Gage and Bill Taubin. On the copy side were Phyllis Robinson, Dave Reider, Leon Meadow, Ron Rosenfeld and Bob Levenson. The managing genius was Bill Bernbach. 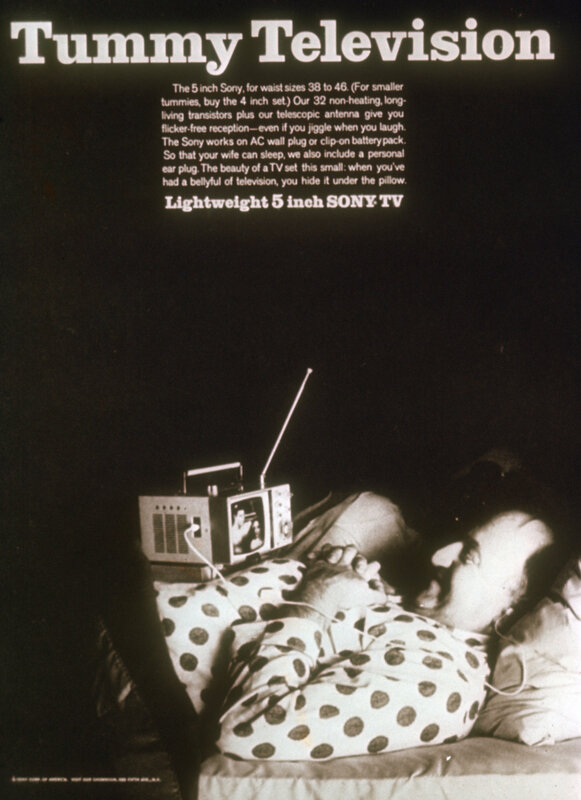 In 1966 Bernbach dissuaded Mobil from doing a conventional centennial celebration and instead Sirowitz developed a campaign that came to be an exemplar for public service advertising. 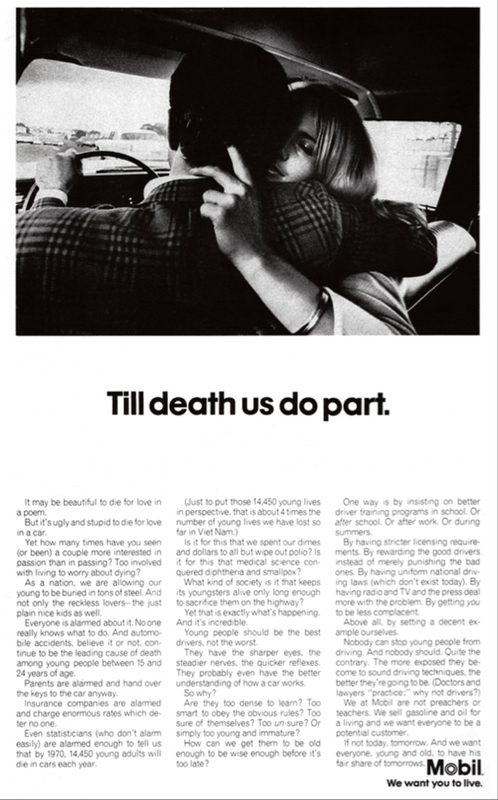 The powerful print and television ads drew attention to a topic of current national interest, highway safety, while promoting a caring corporate image for Mobil. 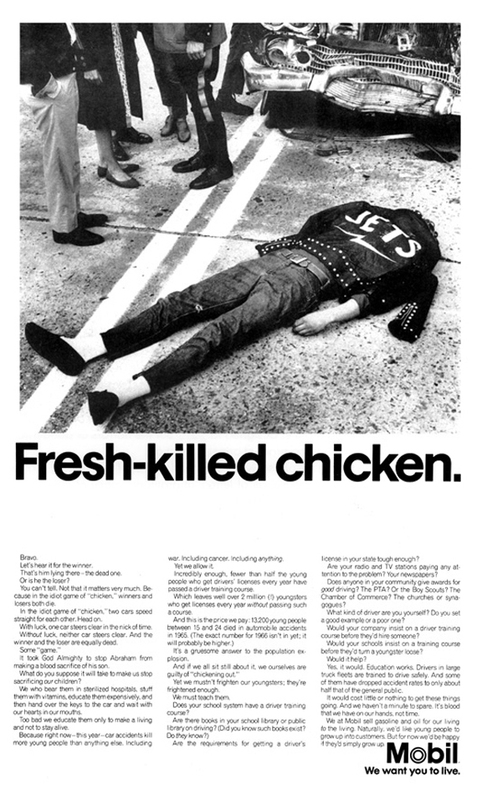 In the midst of Ralph Nader’s crusade for safer automobiles and numerous congressional reports on traffic fatalities, explicit ads like “’Til death us do part” and “Fresh killed chicken” brought the problem close to home. One of the TV spots, comparing a car falling off a ten-story building to a crash at 60 mph, is a classic in public service commercials and won a prize from Rutgers University for best corporate public service campaign. The Volkswagen account was one of Sirowitz’s tougher challenges. 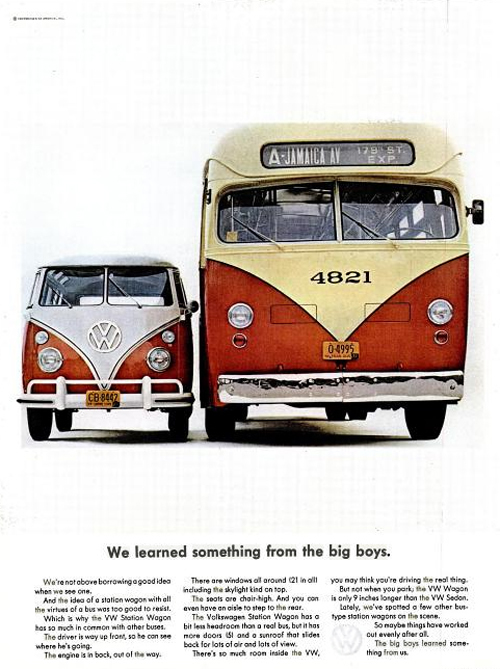 The basic and successful look of Volkswagen advertising had already been established by Helmut Krone when Sirowitz took over the account in 1962. 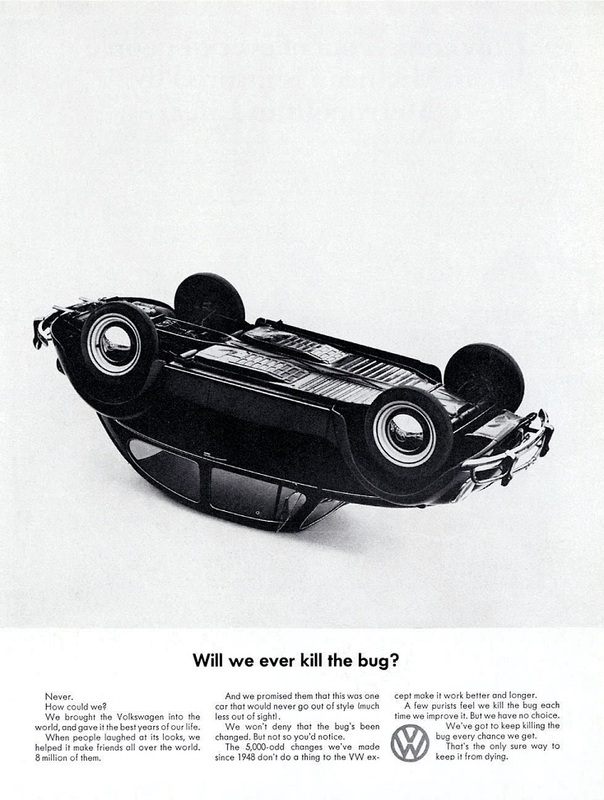 He continued in Krone’s style but infused his own blend of bluntness and humor as in the magazine ad that read, “Will we ever kill the bug?” and pictured a VW beetle playing dead. 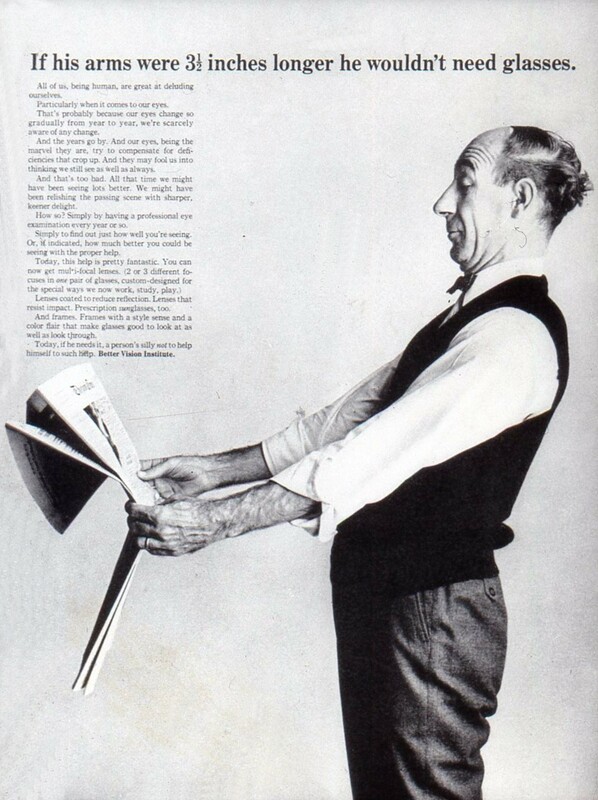 Sirowitz’s regional accounts at DDB were just as notable as his national ones. Television commercials for Laura Scudder Potato Chips on the West Coast pioneered an accentuated audio effect equating crunchiness with freshness. In “The Noisiest Chips in the World,” an incredibly cute child mimics a delightfully silly adult, riveting the viewer’s attention to the ensuing dialogue. 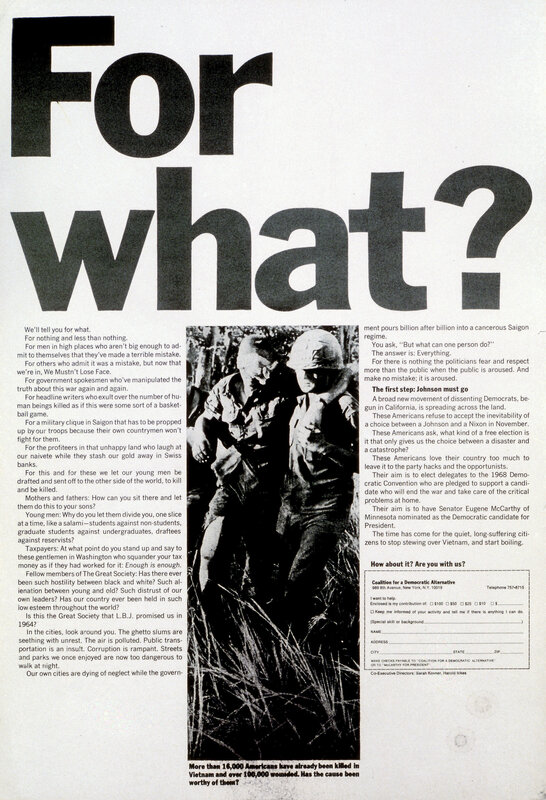 For Rainier Beer, also located on the West Coast, Sirowitz produced a full-page, poster-like newspaper campaign that won for best campaign in the R.O.P. Color Newspaper Awards in the early 60s. While at Doyle Dane, Sirowitz put his advertising skills to another use—political activism. Working for organizations like SANE, Coalition for a Democratic Alternative and later for Eugene McCarthy’s presidential campaign, Sirowitz galvanized the anti-war sentiments of middle class Americans, the so-called Silent Majority, to give the anti-war movement cross-generational scope and respectability. 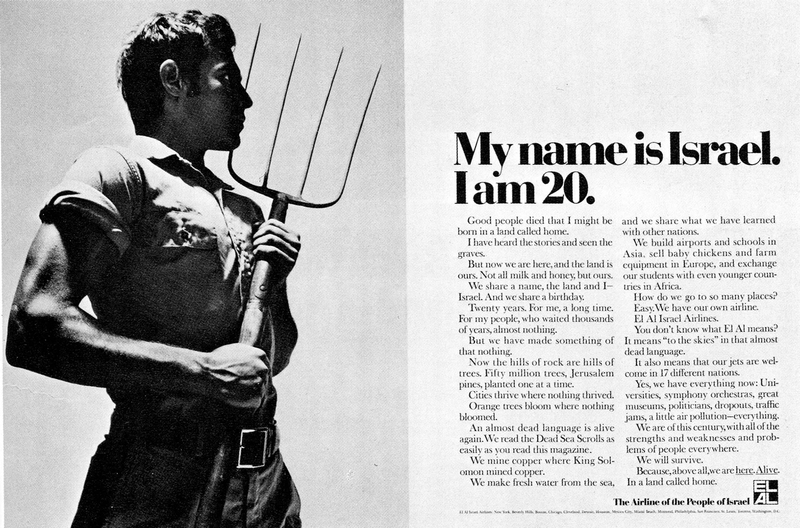 Like much of his advertising, the political work touched the average American. 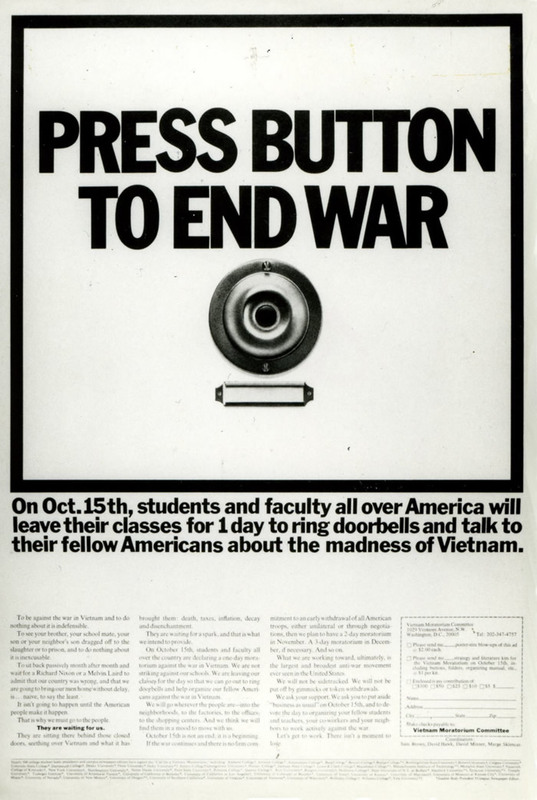 In a candid and convincing style, “Fathers and sons together against the war,” “Press Button to End War,” and “Man VS. Machine” sent the message that peace was not just the banner of long-haired crazies. Sirowitz came to DDB with art directing experience at Channel 13, CBS Network TV, Grey Advertising and L.W. Frolich, a pharmaceutical agency. He remained with Doyle Dane for 11 years and though the idea of starting his own agency had always been tempting, the plunge to independence was really a spur-of-the-moment decision. He happened to run into Hubert Graf, advertising manager for Swiss Air, who asked if he could recommend an agency for the airline. Without thinking, Sirowitz answered “mine” and thus committed, he recruited Ron Rosenfeld also from Doyle Dane, and Tom Lawson from Ogilvy & Mather. Swiss Air was the first account of Rosenfeld, Sirowitz and Lawson, Inc. The agency broke the previous advertising mold of dimpled girls and snow-covered Alps and instead featured a bikini-clad blonde with the headline, “Heidi Lied.” A campaign for ABC-TV won an Art Directors Club Award. A recruitment campaign for Pratt Institute, which featured successful former graduates, won a gold award in The One Show. As Co-Chairman and Co-Creative Director, Sirowitz has helped build RS&L to over $140 million in billings since 1971. The firm’s blue chip accounts include McDonald’s, Chase Manhattan, Smith-Corona, Beatrice, Champion International and Charles of the Ritz. 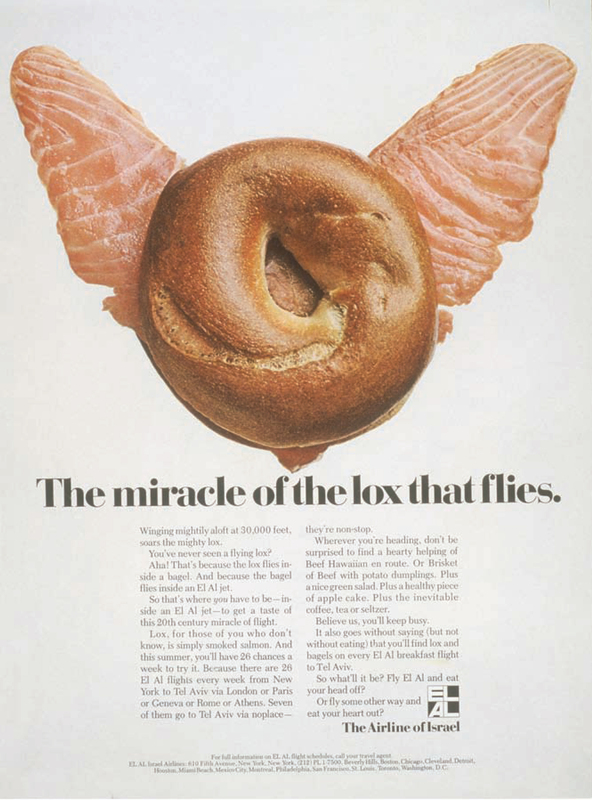 In 1979 Rosenfeld, Sirowitz and Lawson was named “Hottest Medium-Size Shop of the Year” by ANNY (now ADWEEK). Sirowitz’s work is persuasive because it is both intelligent and human. 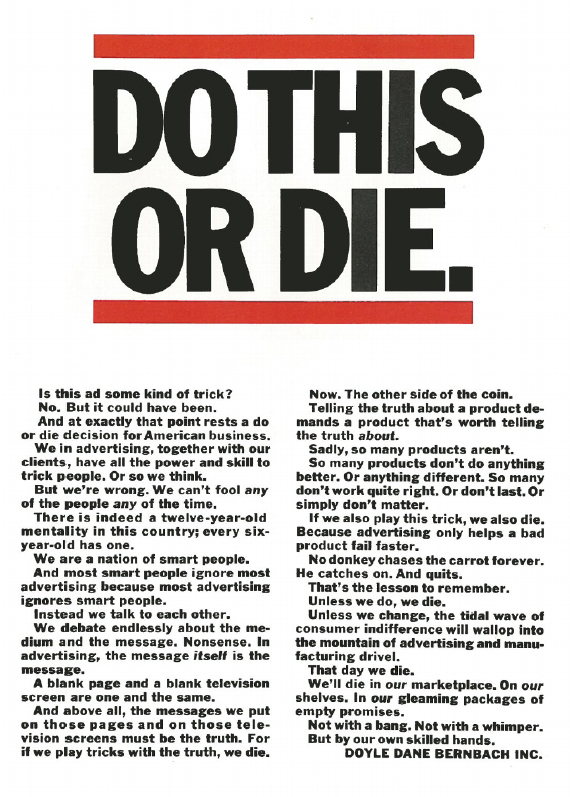 The print ads are bold, direct, sometimes humorous, sometimes poignant and always wonderfully thought-out. One of the outstanding features is how perfectly the copy and the art complement each other for maximum impact. It is as if both are conceived simultaneously. In fact, Sirowitz often functions as both art director and copywriter. The succinct headline style of Sirowitz’s print work suggests a newsworthy message not to be ignored. Likewise, Sirowitz’s television commercials are neither technically overpowering nor esoteric but attention-getting by virtue of their clean, compelling style. The human element, whether sad or silly, familiar or fanciful, imparts an accessibility that gives the message meaning. Sirowitz has won over one hundred awards for creativity in advertising from the New York Art Directors Club, Communication Arts, The Advertising Club of New York, American Institute of Graphic Arts, Saturday Review of literature, The One Club for Art and Copy, the Cannes Film Festival and the American TV Film Festival. His commercials for Mobil, Volkswagen and Laura Scudder have been permanently installed in the Clio Hall of Fame. Most recently he was awarded an honorary Doctorate of Fine Arts from Pratt Institute where he graduated in 1953. Sirowitz is the quintessential art director, an idea man possessing sharp skills, precise instinct and a passion for his profession. When carefully planning my life after the world of advertising, I knew that I had to find a way to continue to let my creative juices flow. Little did I realize, the solution was staring me right in the face. My thoughts traveled back in time to where my love of art and design was first nurtured. Before attending the High School of Music & Art I went to the Art Students League of New York, where I took Saturday morning classes. So 18 years ago, on the very next day after putting the ad agency business behind me, I returned to the “League”, where I have been attending daily ever since. The relationship between the work that I am most proud of in the past and my best work here at The Art Students League, lies in what I try to create with every large format drawing from life that I do. Just as I had done with my ads, I strive for bold, eye-catching, compelling images. My goals are dramatic interpretations of the model’s pose, drawn with energetic, spontaneous, sweeping lines. And just like an ad, each drawing must be part of a well-designed composition. In addition, to satisfy the business management side of my nature, I serve on the “League’s” Board of Directors, where I’m very involved with the running of the school, as well as guiding its communications programs. So, the more things change, the more they seem to remain the same. My favorite sounding board, my wife Mickey Sirowitz, whose wisdom and good judgment I have admired so much over the years, has been at my side ever since we met at the High School of Music & Art. In fact, early next year, the love of my life and I will be celebrating our 60th wedding anniversary. My life continues to be fulfilled.